It's a good question. I'd place odds that 95% of the people in the jewelry business don't know what S-T color represents. GIA starts color grading at D. Somehow A, B and C got left off the table, so D is the whitest of white diamonds. 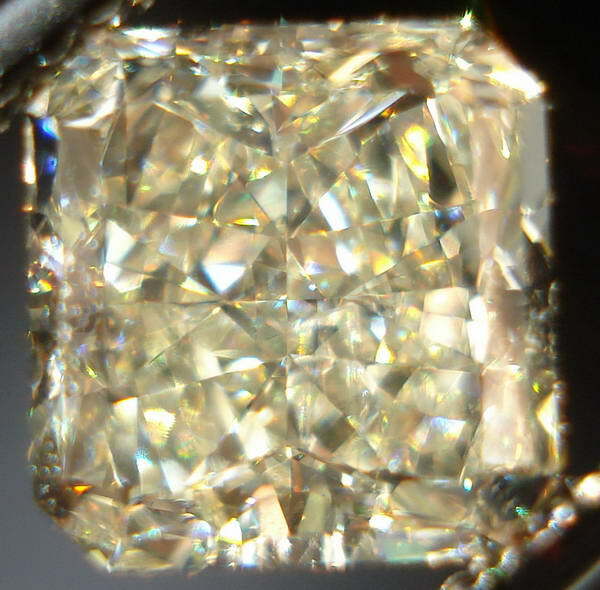 Or more accurately- D is the diamond with the least color, or tint. After that you go to E- which is basically indistinguishable from a D.
Once you get to F you're still not going to see any color- but compare it to a D, and you might be able to notice a slight difference- if you've a sharp eye. It goes incrementally down, G, H, I, and J represent the rest of what GIA terms "Colorless, or Near Colorless". Continuing down the color scale, K shows a slight tint, L a bit more, M and N are really starting to show color. From there, GIA combines the color grades. O-P, Q-R, S-T ( like this one), U-V, W-X, and finally Y-Z. Next color down is Fancy Light Yellow. The combined letter grades represent a great value in my opinion. 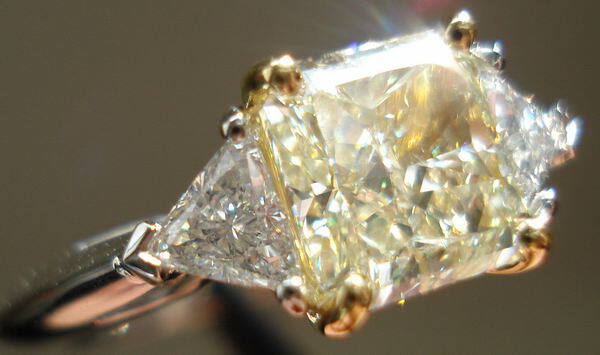 I never minded a diamond that showed some yellow. 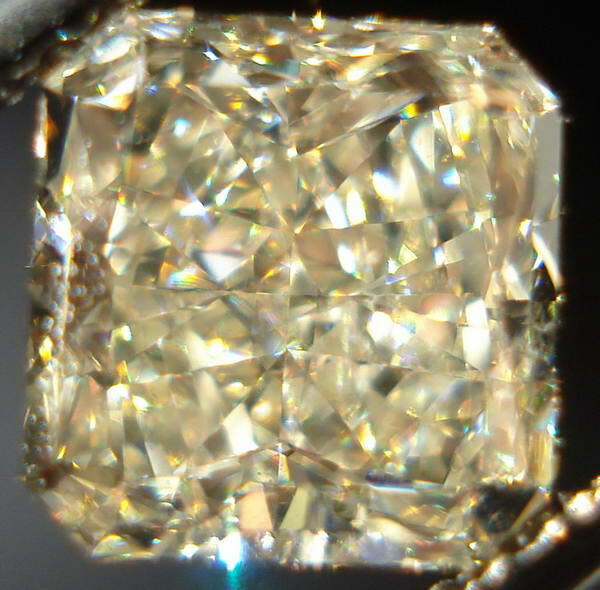 A diamond of any color can have all the beauty of a D, or a Fancy Vivid Yellow- provided we're looking at well cut diamonds. 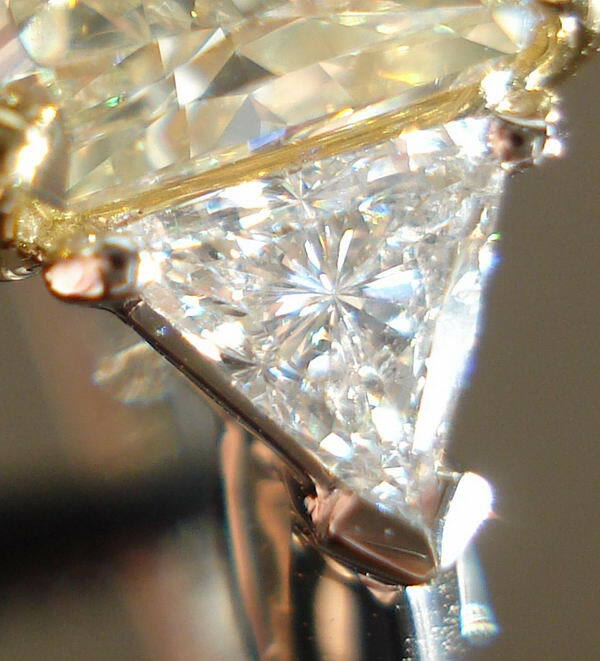 How does a diamond's color affect it's price? Statistically, the market places a high value on both color and clarity. 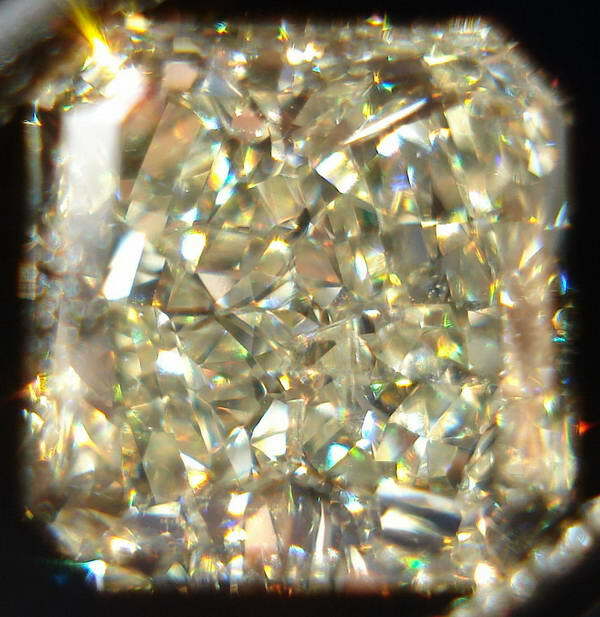 When we're talking colorless diamonds, slight differences in color can result in large price differences. D is waaaay up there in terms of price-as are the deeper yellow colors. 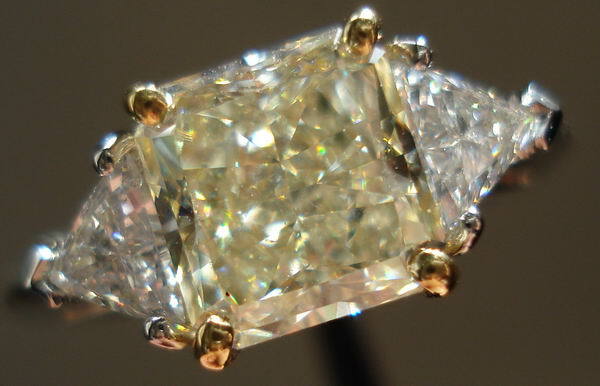 If we had to say- which is the lowest priced color in diamonds with GIA reports? It's probably be the stretch between N, and U-V. Indeed, this diamond is in that group. 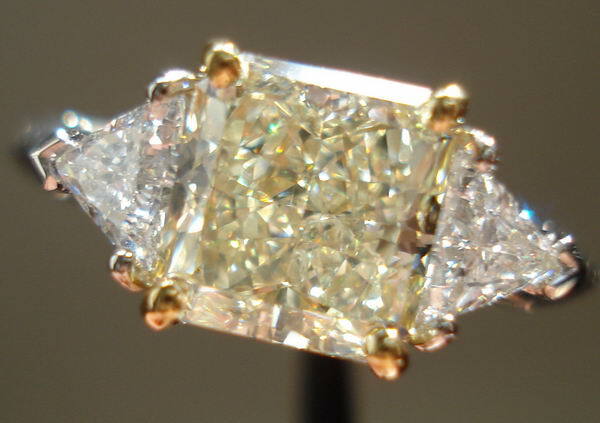 A lower priced diamond that looks as nice ( to me) as a D color. If you like the photos, you'll love the actual diamond. 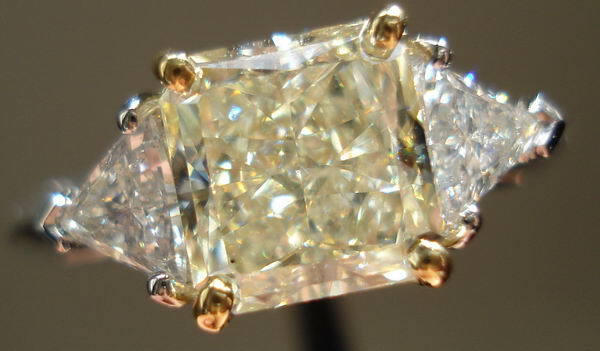 It's a Square Radiant Cut Diamond- with some very nice corners. This gives the diamond a lot of personality, IMO. 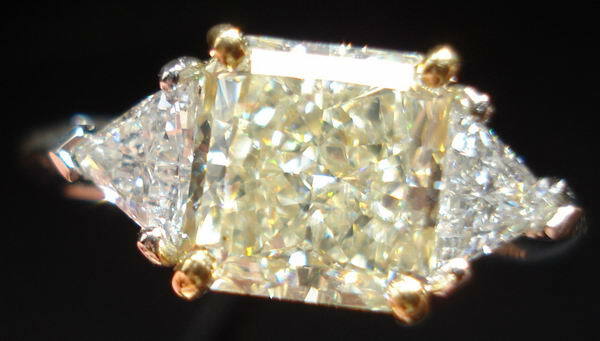 As you can see from these photos- the diamond is a delicate light yellow shade. Since the hue is subtle, the color looks different depending on the lighting. But even in the dimmest of light- this diamond will sparkle back at you! 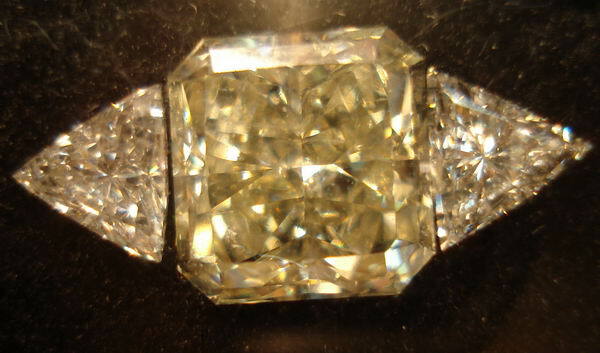 Another aspect of great cut ( besides the sparkle ) is how large a diamond looks for it's weight. 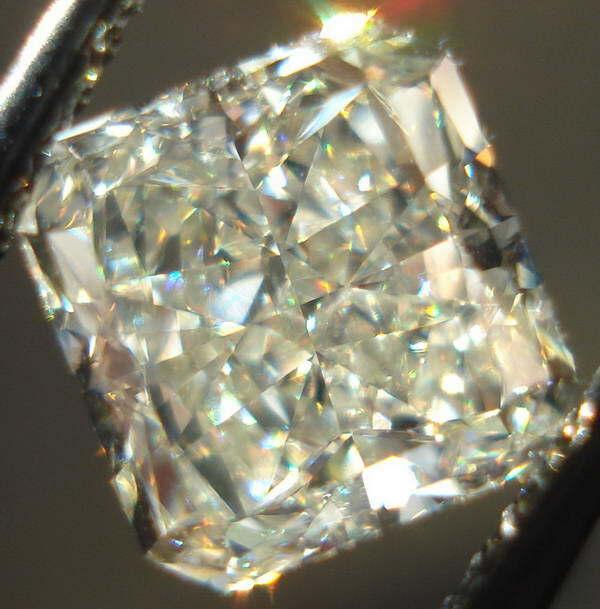 This diamond scores well on this aspect as well- it's large for a 2.05carat. 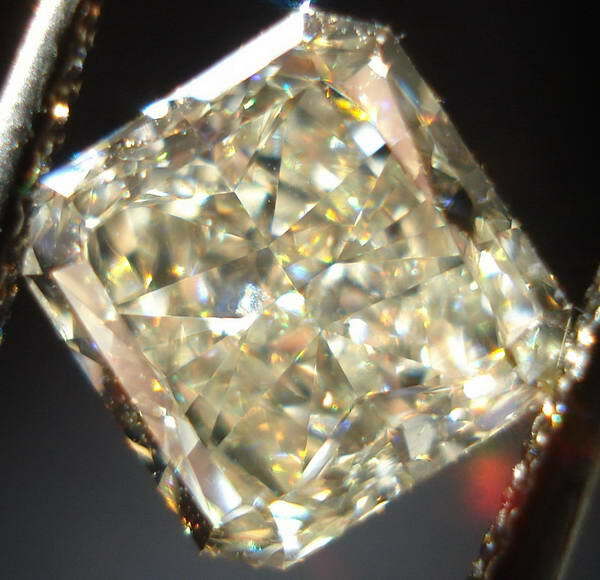 As you can see in the photo below, the diamond has the look of a "bucket of crushed ice"- tremendous sparkle. This stone looked absolutely lovely next to the two colorless trilliants. 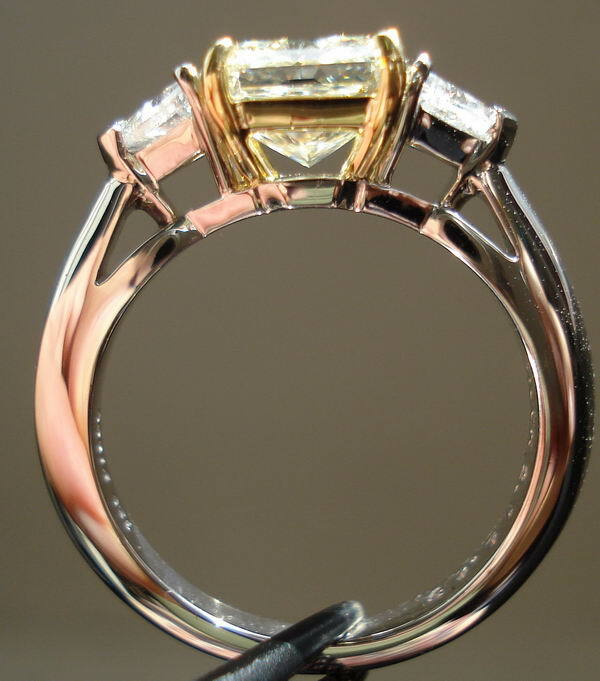 It looked even more amazing once set in the custom made platinum and 18K yellow gold ring! The colorless trilliants are beauitfully cut and show amazing sparkle. To the lovely profile of the ring! It has a nice sturdy feel to it while keeping very feminine lines. Everything about this ring is simply stunning!